To celebrate 10 years of healthy and spirited collaboration, Jeremy Scott has lifted the veil off his latest sneaker for the adidas Originals line. Logical he’d select the iconic and polarizing JS Wings silhouette to mark their decade anniversary. 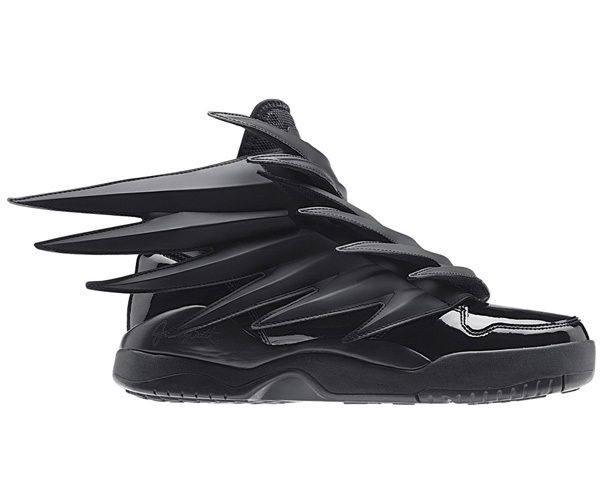 The high-tops get updated with angular molded 3D leather wings jutting from the upper like a Batman cape, and are also outfitted with a removable inner sock made of neoprene and patent leather on the toe. Dubbed the JS Wings 3.0, as this is the third iteration of the sneaker, for now the shoe only comes in black and will be made available on Halloween with the rest of the apparel line.